In our January TV showdown we played our first match against Ealing. I’d first like to extend a welcome to our newest player in the TV League, Thomas Bonn, and I’m even more delighted to congratulate the team for a stunning win we’re going to dub the MAGNIFICENT SEVEN! With an average grade of 178(!) this was our strongest line up so far in the Thames Valley League. It was a great performance across all boards, and the result leaves in second place in the league, with 3 points from 3 games – 100% ! It was a real Heartbreaker in London 4 this week, as we found ourselves on the wrong side of a 3-5 reversal against Wanstead. It was a bitter pill to swallow after we’d built up strong positions on nearly all of our boards, but it wasn’t to be. A combination of overconfidence, carelessness and good old fashioned bad luck saw to that! Chief cheerleader on the night, Carsten, reckoned we should have won 6-2!! And given the cramped conditions in the Citadines, he probably had better scope to review the matches than anyone. Still, a big Thank You is in order for new recruits Tommaso and Blair, who each took home the full point. Superb effort! Add Simon into the mix and it was a case of the new guard trying to make amends for the failings of the old! 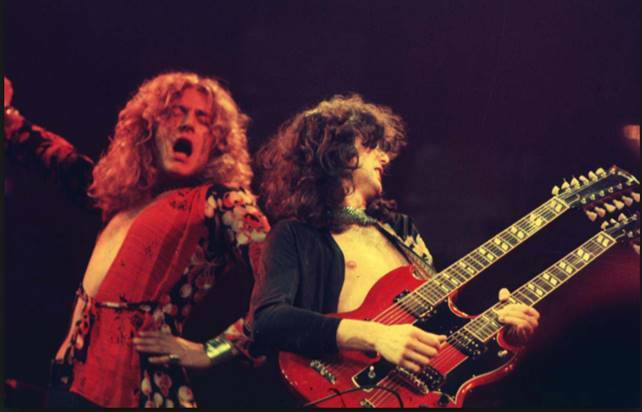 In fact, it was Good Times Bad Times across the board. Each match was decisive, with no draw recorded. I was particularly disappointed in how I played, and from chatting to a few of you afterwards it seems The Song Remains The Same. It was a night of real missed opportunities across the board. Our London 6 team took on East-Londoners Hackney in another clash at the Citadines this week. 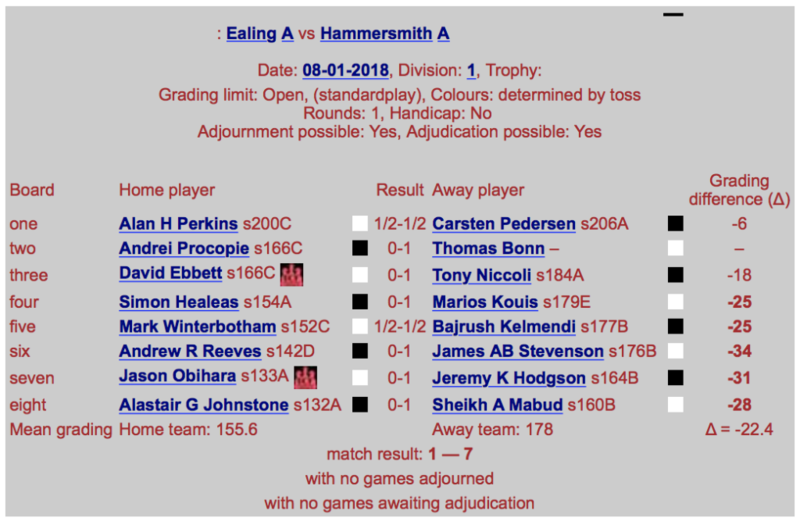 With a double-default on board 3, Hammersmith edged it 2.5-1.5 on the night, with wins from stalwarts Chris and Charlie. A disappointing result from captain Rich on top board was the only downer on the evening! 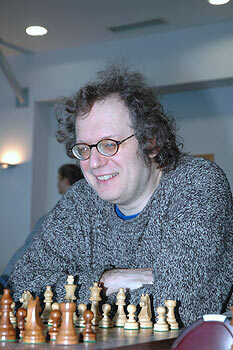 In case you haven’t heard, chess legend GM Jon Speelman is spending a night at The Anvil on Monday 26th February! Jon is an absolute legend of the English game, with honours too numerous to mention. He’s an enlightened scholar in many other aspects and we are delighted he’s visiting us to talk about his game, guide us through a game of his, and answer questions from the crowd. It’s going to be utterly fascinating! We have an EarlyBird offer for Hammer members: £7 if booked before 31st January, rising to £10 thereafter. 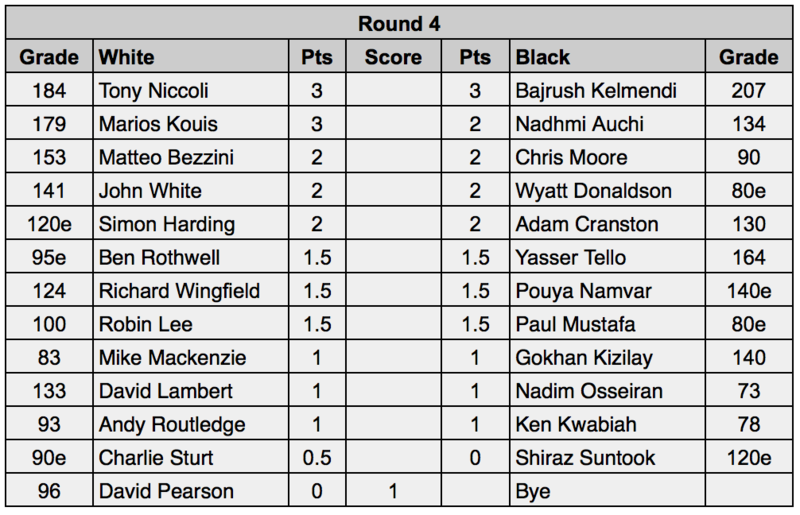 Don’t forget – Round IV pairings for our season-long RapidPlay are now out. You have until the end of the month to arrange & complete your games, and get the result to the tournament controllers, Adam & Dave. As our Chess Club continues to grow, we’re constantly looking for new ways to communicate and get our members involved in all things Hammer. Some time ago we setup a WhatsApp group to help our captains communicate and arrange games. It’s now evolved to become an all-encompassing Hammersmith Chess Club “HammerTime” group chat, featuring no fewer than 21 members & counting! 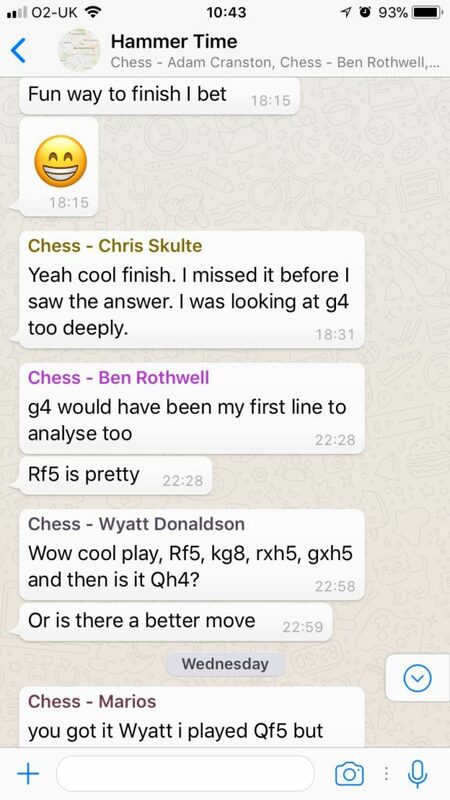 It’s proven to be a great tool for all things Chess – chat, tactics, logistics, banter, advice, and humour! We’re keen to ensure as many members as possible can join, so if you have the app and want to take part, please drop us your mobile number and we’ll add you. Definitely the more, the merrier! That’s all for now – keep your eyes peeled for the next instalment of our Puzzle of the Week, dropping in a couple of days time! And good luck to our players next week – four big games coming up!